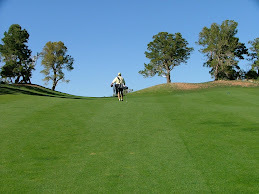 All of us who love to play the game of golf have a number of favorite holes that we have played. Our fantasy is to transplant those holes to a mythical course that we could play forever. It would be a place where we could visit to get a small taste of golf utopia. Alas, these courses that we build in our hearts and minds are a daydream, a mental image that we conjure up as we envision a life with nothing but the greatest game of all to occupy our time. Fortunately, we now have been provided some visual and written assistance to serve as guidance along the paths of our fantasies. 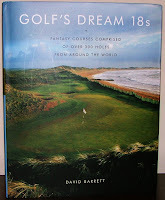 David Barrett's newest volume, Golf's Dream 18s, has taken the daydreaming to a new level. Recently published by Abrams Press, the leader in dynamic, visually appealing golf volumes, Barrett takes the fantasy course scenario to the ultimate extreme. Golf's Dream 18s is a collection of fantasy courses, 18 to be exact, that teases the golfer's mind and pleases his visual senses. Barrett is well equipped for the job. He has served as a senior editor at Golf Magazine and he also produced a similar volume from Abrams Golf Courses of the U.S. Open. Barrett's organizational structure of this volume provides us with a fun look at over 300 holes from around the world. He starts us off with a short introduction and then guides us through 18 holes on 18 individual fantasy courses with each “course” having a specific theme. We get to tour courses with Scenic Holes, Historic Holes, Exclusive Holes (ed. op., holes virtually no one can play), Holes Anyone Can Play (ed. op., which is more like it), Modern Holes, Classic Holes, and twelve other themed, fantasy courses culminating in The Ultimate Dream 18, an all-star team of the holes in the book. What really makes Golf's Dream 18s really enjoyable is that each hole is accompanied by a first-class picture (This is what Abrams does quite well.) and informative text. We learn a little about each and every hole. Unfortunately, there are no diagrams of each hole which at times left us wondering how the entire hole looks. This book is a heavyweight, literally and figuratively. It comprises 324 full-color photographs and 304 pages. Together with the hardcover and the eye-catching jacket, it tips the scales at approximately four pounds. But its content is also fascinating. To date this is our second favorite book of the season, ranking right behind SI's The Golf Book. (But that may be because we are slightly more interested in golf history than course architecture.) You can't go wrong with this volume for your favorite golfer who loves golf courses (and a little bit of fantasy).